Before we get to the Shadowrun: Crossfire review, we think it’s important to point out that none of the people in our group have ever played the Shadowrun RPG. However, as you will see below, you really don’t need to know anything about the Shadowrun universe before diving into this game. 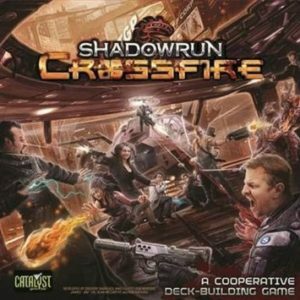 Shadowrun: Crossfire is a fantasy deck building game where your main goal is to survive as outlaws in a world of ruthless megacorporations. Though you’ve been assured your job is easy enough, everything starts to go terribly wrong. You must adapt and work together through different missions to come out of the job alive and stronger than ever. At the beginning of the game, each player chooses a character and a race (for example, you could play as a Street Samurai Troll). Each character starts with his or her own attributes and cards, which allows for customized play as the campaign moves forward. Players draw a number of cards determined by their race, which will be their opening weapons and items to use during the campaign. On each turn, obstacle cards / enemies are flipped to determine what each character will go up against. Some of these enemies will have special abilities, while others can be defeated by simply matching cards to the symbols on their hit tracks. Players will also have an opportunity to buy new cards for their decks during their turns. Unlike other deck building games, the cards you buy go directly into your hand. These cards can be used immediately on subsequent turns. Shadowrun: Crossfire isn’t all about just building your decks and fighting bad guys, though. Well, it kind of is, but you also have to pay attention to the current event that is going on. Each Crossfire card that comes out at the beginning of the round will alter the way that you handle your current situation. Most of these cards make the game much harder, which incentivizes you to get through your mission as quickly as possible. In the main mission, Crossfire, you must survive three rounds of play to win, gaining karma. As you gain karma, you can can upgrade your character in the form of stickers. If even one character survives the mission, players receive partial karma and can move on to the next mission. Here is a PDF with the Shadowrun: Crossfire rules if you want to learn a it more about how the game works. Shadowrun: Crossfire uses a great mechanism that allows for continual development of your characters. That alone makes it quite different than other deck builders we enjoy, like Legendary: Marvel and XenoShyft: Onslaught. We weren’t sure how well this would work, but it actually forces you to really care about your characters long-term, which is pretty rare in tabletop games. I’m always a fan of deck building games that allow you to buy cards and put them directly into your hand. The Crossfire cards are awesome. They change the way you approach each round, giving you plenty to talk about and leads to some cool tactical decisions. We also really like how well cooperation was implemented into this game. You simply cannot do well in Shadowrun: Crossfire without working together. You can attack enemies in front of other players, you can assist your teammates, and you can even pull enemies towards you to keep other players from getting overwhelmed. The campaign itself is loads of fun because you get to build your characters the way you want to, making each mission that much more memorable. Plus, you really do care about upgrading because you need to build your characters well to be able to hand the (very) tough missions. We love difficult cooperative games, but some people may find Shadowrun: Crossfire to be a bit too challenging. More often than not, you will have to abort your mission simply because you did not play perfectly. That can be frustrating for new players, but our advice is to keep playing and you will see that those small benefits that you get when you are defeated make future plays a bit easier and adds to the overall enjoyment. I like that you can build characters over a number of missions, but I wish they hadn’t chosen to use stickers. Sure, you can always put one sticker over another if you choose to reuse a character, but wouldn’t it have been easier if they just added a second set of cards for upgrades? It’s not a huge problem, but I think cards or something else less permanent would have been a cleaner way of doing it. Shadowrun: Crossfire is a beautifully designed deck builder that just about any co-op fan will enjoy. It has a ton of replay value thanks to the upgradeable characters, and the missions themselves are, for us, perfectly challenging. Even if you don’t plan on putting in all of the hours it would take to fully build up your characters, it is still worth checking out just to see how unique it is and how well it plays. 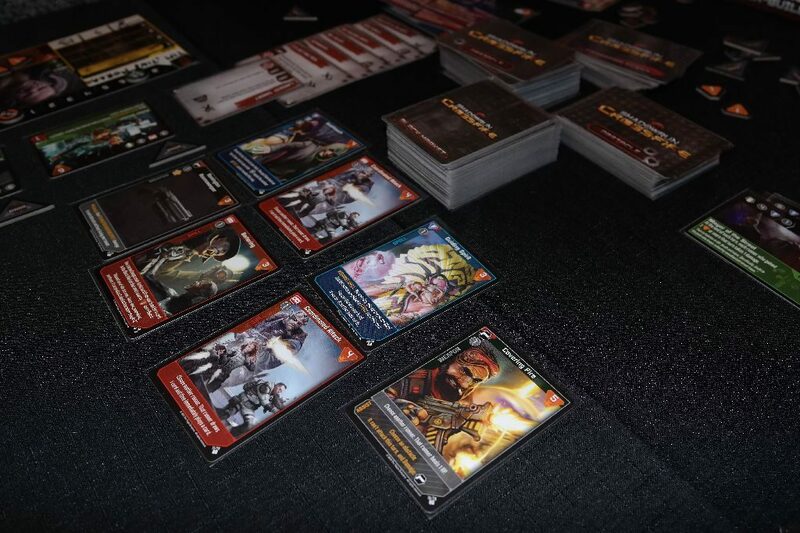 If you end up having a blast playing this game, definitely check out the Shadowrun: Crossfire expansion, Shadowrun: Crossfire – High Caliber Ops, which adds a lot more cards and stickers to the game. Thanks for taking the time to read our Shadowrun: Crossfire review!